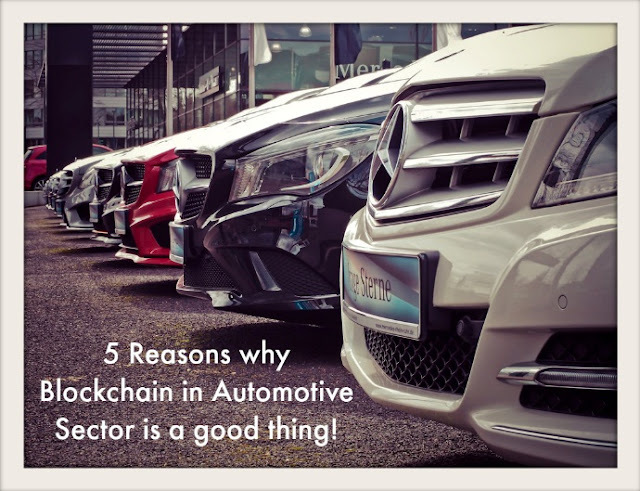 Home / Finance / 5 Reasons why Blockchain in Automotive Sector is a good thing! 5 Reasons why Blockchain in Automotive Sector is a good thing! The automotive industry is transitioning through a seismic shift as our relationship with roads and technology changes. When we buy cars now, the myriad options of electric vehicles, fully autonomous cars along with ride-sharing brands have formed a revolution in car ownership. The blockchain is here, starting fires and storms, making enormous changes in the automotive industry. The world is moving towards a singularity in the automotive sector, and its complexity is nearly impossible to understand or picture. While we may feel excited about the change, there is a lot that needs to be considered. Elements such as logistics and car ownership, partial renting during work hours and vacation are all the ideas that blockchain introduces to the automotive sector. Before we proceed to explain how blockchain is good for the automotive industry, here is an explanation about what blockchain is. A simple Google search gives you the answer above. In other words, blockchain allows the distribution of digital information without copying it. It was initially devised to support the digital currency, namely Bitcoin. Then the tech community found out that blockchain is a coal mine full of potential uses. Just like a car, you don’t need to understand the mechanism of blockchain to use it. Research reveals that by 2020, more than 250 million cars will be on the road globally. With the fastidious inventions such as cloud-based core information systems, connectable infotainment, and smart sensors, an increased need for data management is growing by leaps and bounds. Under such circumstances, blockchain is the rescuer everyone looks forward to. It is an uncomplicated medium that securely allows shared access to data while carefully maintaining the privacy of the participants. To explain it better, blockchain is a distributed ledger that offers superior data encryption methods to maintain user safety and confidentiality. Here is a list of 5 reasons why the introduction of this ingenious invention in the automotive sector is a brilliant idea! Autonomous cars have a bright future where millions of devices efficiently communicate and interact. They do this while maintaining transactions on a database that is shared and secured and permission is a complicated feat. A shared ledger between automotive part distributors, dealerships, insurance agencies, and other departments could utilize the car’s ability to identify its needs. For example, if a vehicle self-diagnosis a need for repair, it can contact nearby suppliers or garages for replacements or repair. The negotiations of pricing and appointments for servicing, washes and what not, can all be done by the car itself. The reason why blockchain can be a tremendous help in the development of such autonomous vehicles is the transparency it offers. The announcements by Renault’s digitalized car maintenance systems for maintenance history and repair logs accompanied by Tesla’s blockchain-enabled tollbooths are examples of progress. A common yet unacceptable practice in the automotive sector is the lack of information provided to banks that have purchased vehicles from the showroom. It provides the dealer with easy access to working capital. However, the use of blockchain will put an absolute end to such sketchy practices by keeping things transparent. Platforms such as Autoblock, based on blockchain are the solution to this problem. They provide complete records of the vehicle whenever it is required. Other such platforms can make it easier to predict the resale value to the utmost accuracy when we buy cars off a second-hand dealership. It is common for major industries to introduce a reward program to increase customer engagement and retention, and multiply revenue in manysectors. These include hospitality, beauty, grocery, gaming, financial services, car rentals and what not! The points going unused or an on-the-spot, one time sign up does not benefit a business, or limited value accrual never works for the customer. Hence, there is an opportunity for companies to use data for better contextual marketing. The self-driving smart car presents the perfect platform to explore the potential through blockchain-enabled rewards systems. This can be facilitated by a shared database that manages enormous volumes of data and transactions that has permissions to appropriately reward the customer. This is a brilliant idea for both the parties involved. It is well-known that a majority of auto parts dealers struggle with the verification of genuine parts. The use of inferior quality parts has damaged the reputations of multiple supplier brands and the automakers too. Blockchain can be an easy assistant in this situation. It can create unique identities and enable time stamps for each part. These IDs once connected to a blockchain can increase authenticity, and the strict encryption will keep fraudulent services at bay. The insurance claiming practices used today still depend on extensive manual work regarding documentation and submission. The resource review for the verification of the claim is a disastrous task for the agent as well as the consumer. The useof a shared ledger in this scenario is the best thing that could happen to the industry. It would streamline the claim process and also figure out the payouts and service contracts related to the financing and execution of the repairs required. The automotive industry can use blockchain to automatically deploy technicians and automate the verification process.